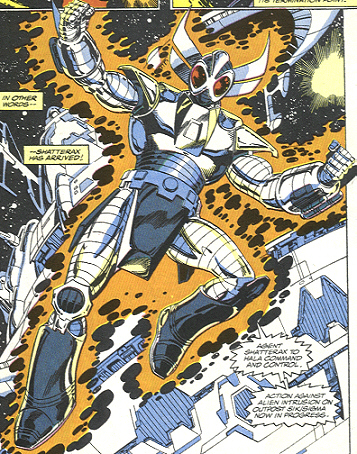 Powers/Abilities: Shatterax could survive unaided in the vacuum of space, fly, possessed superhuman strength (class 50? ), and had the ability to shoot strong energy blasts. 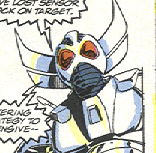 He could also build up his power for a "neuron wave barrage," which discharged an especially powerful blast. He also had advanced sensors that could see through even advanced forms of stealth technology. History: (Iron Man I#278) - When a squadron of Avengers entered Kree territory in an attempt to halt the Kree-Shi'ar war, the Supreme Intelligence contacted a group of scientists that were working on a cybernetic agent called Shatterax. He instructed the scientists to bring Shatterax online. The Supreme Intelligence was warned that Shatterax was undergoing extensive repairs and refitting, but brought him online nonetheless, albeit with a shortened functional life span. The Supreme Intelligence then sent Shatterax to apprehend the Avengers. Before long, Shatterax arrived at the outpost where the Avengers were and was engaged by Iron Man. Shatterax fought with Iron Man and gained the upper hand until Iron Man realized that his life support systems would fail if the battle went on. Iron Man surrendered on behalf of the Avengers to Shatterax and the Kree Empire. (Captain America I#399) - Shatterax marched the captive Avengers into Hala until Ronan the Accuser relieved him of his duties. Later, Shatterax was summoned by the Supreme Intelligence along with Ultimus, Korath, and Supremor to form the Kree Starforce. (Quasar#33) - Shatterax teleported to Earth and freed Captain Atlas from his imprisonment in order to recruit him into Starforce. (Avengers I#346) - Shatterax and Starforce were sent by the Supreme Intelligence against the Avengers on Hala. Though the Avenges managed to hold their own for a little while, they became slowly but surely overwhelmed by Starforce. The battle ended when Deathbird slew the leaders of the Kree Ael-Dan and Dar-Benn, resulting in the Supreme Intelligence assuming leadership of the Kree again. The Avengers were all taken into custody. (Thor I#446) - The Supreme Intelligence sent Shatterax, with Starforce, to the Throneworld of the Shi'ar to assassinate the ruler of the Shi'ar, Lilandra. The Starforce found, however, that they first needed to contend with the Imperial Guard and another squadron of Avengers that had gone to the Shi'ar galaxy. Shatterax engaged the Imperial Guardsman Hardball and managed to incapacitate him, but before he could finish Hardball off, Captain Marvel (Photon) intervened and defeated Shatterax by overloading his systems with a massive electronic surge. (Avengers I#347) - After the decimation of the Kree empire, Lilandra assumed leadership of the Kree, and set Deathbird to rule the planet Hala, with Starforce (including Shatterax) as her own Imperial Guard. (Quasar#35) - Starforce intercepted Quasar and his allies Makkari and Her on Hala. Although the three heroes had come to assist Hala in rebuilding the planet, Deathbird did not believe them, and instructed Shatterax and the others to attack. Quasar and his friends fled to avoid a pointless battle. (Blackwulf#10) - Shatterax of Starforce joined members of the Underground in the final battle against Tantalus and his Peacekeepers, during which Tantalus was slain. (Annihilation: Conquest#1) - Absorbed into the ranks of the Phalanx as one of their select, Shatterax joined select members Korath and Xemnu with the Phalanx forces sent to Terma, where they clashed with Adam Warlock, Quasar and Moondragon, but Adam Warlock spirited himself and his allies away. When Korath, Xemnu and Shatterax reported their failure to the Phalanx leader Ultron, Ultron destroyed Korath to teach Shatterax and Xemnu a lesson. His real name was revealed in his profile in OHotMU Update 2010#3. Thanks to Brandon Nash for pointing out the names of the Kree leaders slain by Deathbird.